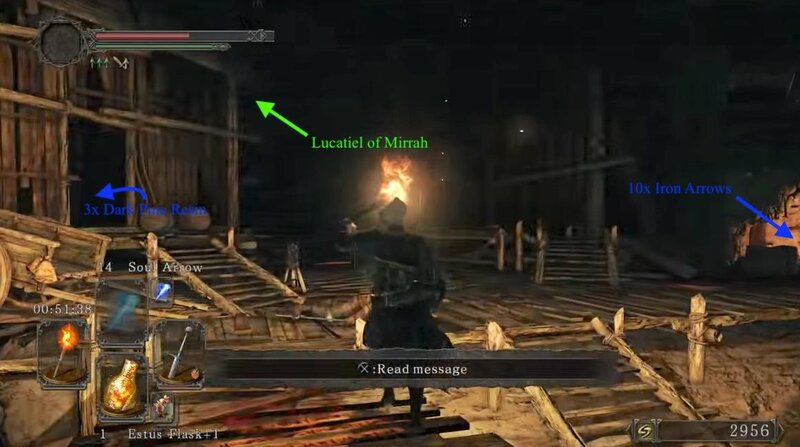 No-man's Wharf is a location in Dark Souls 2. It is a port town with undead pirates and plenty of treasure. The area makes use of the torch and fire features for enemy attacks and defenses, so be on the lookout for useful contraptions and bring a torch with you. Shooting an arrow at the bell will also call the ship. This can be used to skip certain sections of the area as you have no need to travel to the bell yourself this way. The area is completely optional if you take the Pursuer's bird nest to reach here. Lighting the sconces as you advance through the zone makes it substantially easier to navigate through if you die. Torches are your best friend in No-Man's Wharf. Darkdwellers are afraid of light. If you have a torch out they will not rush you, and instead will shreik and flee away. If they flee for too long without being killed, they will become aggressive and attack you like normal. From the area above where you defeated the Dragonrider, exit straight onto a walkway and into another tower with a spiral staircase. Descend down and hidden behind the staircase is a corpse with a Monastery Charm. Go through the doorway and down the hall. On your right the hallway opens up and you meet an Old Knight guarding a doorway. Kill the Old Knight and continue straight to the end of the hall where you find a corpse hanging over the railing with a Human Effigy and a Dark Troche. Close by are two corpses with a Soul of a Proud Knight and an Old Knight Halberd. Go back down the hall and into the doorway the Old Knight had been guarding. Down the flights of stairs brings you to the next level down. Going left leads to a dead end where a Royal Guard protects a metal chest that contains 1x Sublime Bone Dust. To the right is a hallway which leads to a round room with a pressure plate elevator in the center. Stand on the plate and descend to the next level down. At the bottom, head out into the flooded corridors, passing the first small alcove to find a larger area to your left. This area holds a Basilisk and a few Hollow Infantry that rise up from the waters. There is a doorway behind these enemies that is blocked by a petrified enemy. If you unpetrify it and go up the stairs you will find a Primal Knight and a corridor. 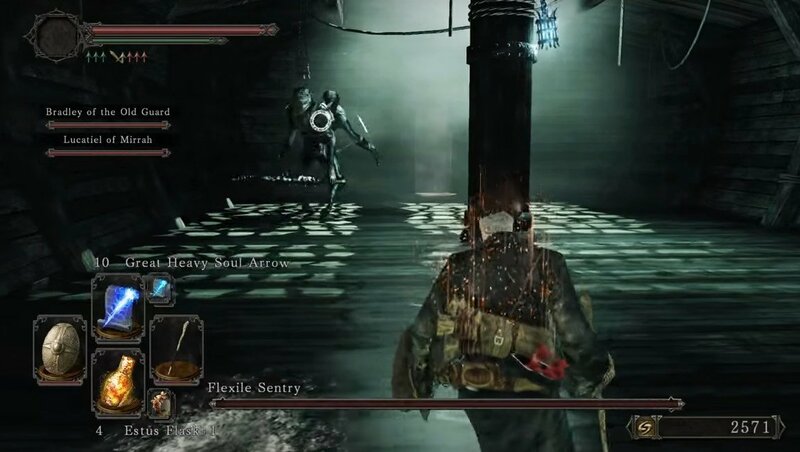 A body hang on the railing and it holds 1x Estus Flask Shard, going left leads to a dead end at an iron door. Going right to the end of the hallway brings you to an iron chest in the alcove to the right which contains the Knight Set of armor. Continue and at the end of the hallway, a knocked out hole in the wall leads to path and a bonfire. Continuing on from here will bring you to No-Man’s Wharf. 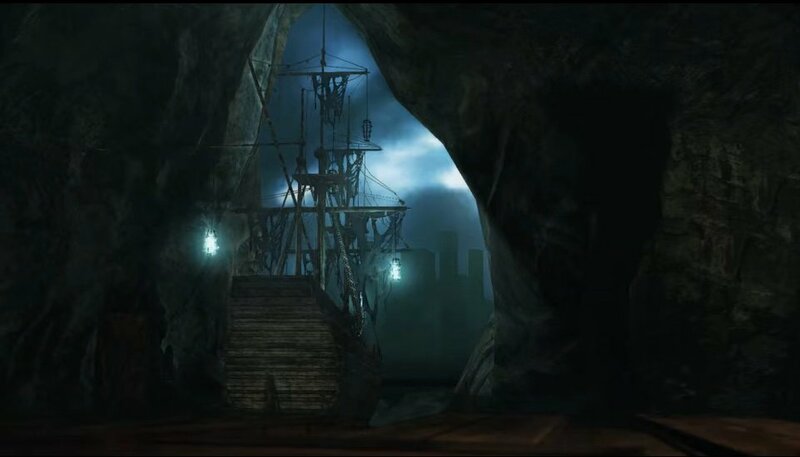 That being said, No-Man's Wharf could be considered an "optional" area as players can opt to take the large eagle behind The Pursuer instead of taking the boat to The Lost Bastille. 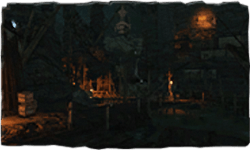 As soon as the title prompts, letting you know you've arrived the No-Man's Wharf, you will be greeted by a Stray Hound and a Hollow Infantry. Be careful here, as there two archers, one on the dock straight ahead and the other on the far right, who will continue to shoot fire arrows at you until you kill them, which is made more dangerous by the Hollow Varangians in this area that will try to douse you with thrown oil bombs. When they get it right, it hurts. In any case, if the archer hits you, take a step back until his arrows no longer reach you. From here you can snipe him with a bow and arrows. You may want to clear the immediate bottom level of enemies by luring them back to the bonfire, and light the multiple fire torches to give you better visibility of the area. Head through the hole in the wall to enter a room with two more Hollow Infantries. After dealing with them, head up the stairs where there is a chest containing a Titanite Shard, and deal with the Varangian on the balcony to claim a Soul of a Proud Knight from the corpse hanging off the ledge. Head back down and left. You should see an item in the water, which is a Large Soul of a lost Undead and a Lifegem. Climb up the steps next to you, and before you proceed left, beware that you'll be engaged by another four Hollow Infantries. Heading right will bring you to a seemingly inaccessible room, blocked by some crates. Destroy these then attack the neutral torch wielding hollow, who is targetable but will not attack. You'll be attacked by another Varangian shortly after. Pick up the 10x Iron Arrows here too. Heading into the building on the right, you'll find a body holding 3x Dark Pine Resin.Go up the stairs, kill the enemies that approach you and enter the building on the left. Go up the stairs in the middle, which continues with the rest of the walkthrough. You will be attacked by a Varangian, and a Hound. Deal with them then break the carriages on the right and proceed. Here you should find the archer from earlier. On his ledge, on the left, you can also find a Large Soul of a Proud Knight, and a Small Smooth & Silky Stone. Grab this, drop down, then make your way back up and enter the building on your left to dispatch two sleeping Varangians. There's a chest here containing Brigand set and a Bandit Axe. Dash up the stairs and take out another: if you're too cautious here, the bandit will hit you with a plunging attack on the stairs. 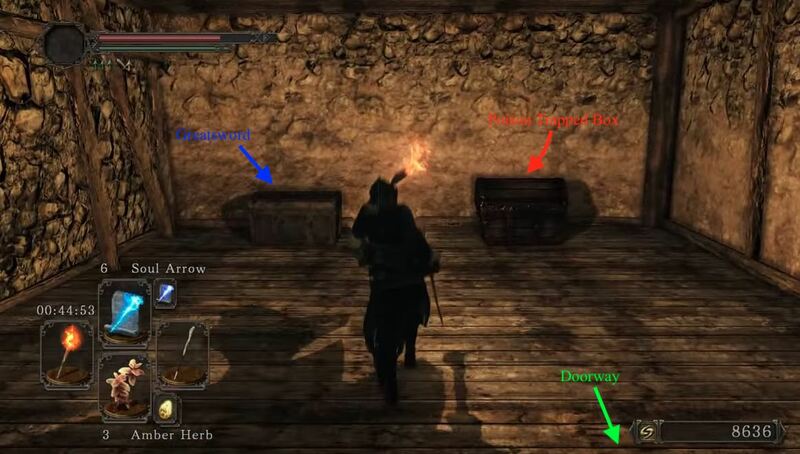 In the room at the top of the stairs is a chest with a Repair Powder and a Titanite Shard. Outside this room are two more archers. Dispatch them and note the locked gate here -- we'll open this later for a handy shortcut. Once all the bandits in the building have been eliminated, go back down to the courtyard outside the ground floor and move towards the cliff overlooking the beach. You should see a stone face (Pharros' Contraption) on the ground and another Varangian bandit. If you use a Pharros' Lockstone here, the overhead lantern will light and the Darkdwellers will be largely confined to building interiors. This makes travel significantly easier through No-man's Wharf. The rest of this walkthrough assumes you have lit this lantern. At the very top, in the room on the left, you will find Lucatiel of Mirrah. On the left of the doorway, destroy the wooden structures to reveal a little alcove with a body holding Human Effigy. Outside 2 Varangians wait. Ahead, another 2 Hounds and another Varangian also wait. At the very right of the area, you will find a set of stairs up, and there will also be an archer, and a Oil Urn-tossing enemy. This combination is no bueno. So either take them out quickly using ranged attacks, or run up the stairs. This will lead to the Darkdwellers area. Wielding your torch will cause them to cower for a upon initial contact. This gives you enough time to take them out, but if you're not quick enough, they will find their composure and ignore the torch. Lightning or Fire are effective against these enemies. If you don't have access to these or you're a melee build, try wearing light armor (25-50% load for the most agile rolls) and a reasonable shield (tested using Crimson Parma & Large Leather shields). Simply move within range of their attack and then immediately retreat several steps. As with most enemies, they will telegraph their attacks. When you see them hunching their shoulders before a swing, roll away then jump in and swing for one hit. If they stagger, which they generally will, continue to swing until your stamina is low or they die, then repeat. Watch your stamina to be sure you have enough stamina left to roll back and NEVER take on more than one at once. If you do, they will essentially stunlock you by trading off attacks and you'll be helpless against the cumulative Bleed damage. Every single one of them can be baited out on their own. Standard practice applies: If a second follows, simply back up until the second returns to their hidey-hole. If the target returns too, re-aggro it via melee or long-range attack. Arrows are useful for this. Note: Engaging the lantern will confine the Darkdwellers to the shadowy rooms allowing you to bait them out one at a time! See above for details. 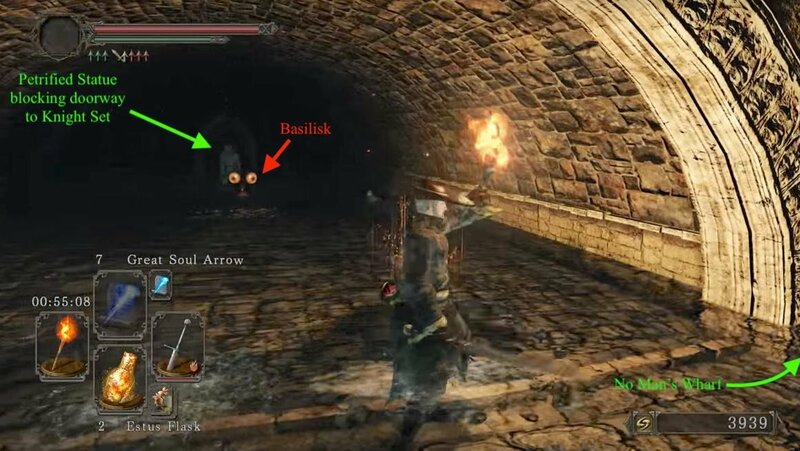 Passing the first three Darkdwellers, you'll find an item on a small cliff on the right. Pick it up (1x Large Soul of a Lost Undead, Emit Force) then head into the room through the hole. You will find only a door in here, which you should open and then immediately roll away as a Darkdweller destroys the wall to reveal a two Darkdwellers in the room, with another set to jump down through the hole in the ceiling. Once dealt with, head upstairs and take care of the final Darkdweller in this building. The door in here will lead to a room with a hole in the wall on the right, and two chests on the left. Of the two chests, the one on the right contains a poison trap, which you can trigger by opening it then rolling away to avoid damage. Within in, find 2x Silver Talisman. The chest next to it is a lot more straightforward, and contains the Greatsword. Drop down the hole and continue to the end of the path. Head up the stairs dispatch the Varangians here. Go out the doorway, then left up a set of stairs to a platform. There's a bell here with a lever. Pulling the lever will cause the bell to ring and the ghost ship in the harbor to move towards the dock, so that you can eventually access it, and ultimately the Flexile Sentry boss. Continue on, dropping down the gap to the left of the bell. There's a corpse here with 2x Lifegem, and a Homeward Bone. Drop underneath the platform you just dropped from, and then again and kill the Varangian standing directly below you, and the one hanging off the side on the left. Open the door and head into the small room with containing two more Darkdwellers. Halfway up the stairs is a corpse with 10x Fire Arrow. Head back out the room and down the ramp to trigger a Suspicious Shadow to drop from his hiding place near the door. At the bottom of the slope, you'll get jumped by another so keep your guard up. Head down the rock ramp and drop down to the stone-paved yard. Head straight past the brazier on your right, to an archway leading to a door and a room. Opening the door, go straight ahead to an Illusory Wall. Inside are two chests with a Large Titanite Shard and 3x Firebomb. Head back out and up the stairs to fight a waiting Varangian then continue up to the NPC Lonesome Gavlan; you can sell gear you don't need to him for some extra souls. Continue behind him, and raise the shortcut portcullis by pulling the chain, which leads back to a ledge above the courtyard with the Pharros' Contraption. Now backtrack to the ground floor and head back to where you originally dropped down. Just past here on the left is a small room with two sleeping Varangians, and a bunch of urns filled with poison. Another Shadow will show up when you get near the door. Lure the Varangians outside, and dispatch them. Once back in the room, don't break any urns unless you do so from a distance with a long spear or such. Entering the room, on the left are two urns blocking a corpse with Throwing Knife x7 and a Flame Butterfly. In the right corner, behind some other urns is a chest with a Fragrant Branch of Yore. To the left of the chest is an unstable wall which you can shatter with a strong leaping attack or a spell. Behind the wall is a Crystal Lizard, so move quick. There's also a chest in here with a Royal Soldier's Ring. Head back out of the room and right to a stone stairway heading down. As you near the bottom, you'll see to Darkdwellers with their butts sticking out of a large hole in the wall. Past the room, continue straight onto a dock. You'll see notice a corpse hanging off a boat to your right. Head past that for now, and turn right. There are two more Varangians hiding here, hanging off the side of the dock. Take care with them but with caution, as falling off the far side of the dock is instant death. Once they're gone turn right back towards the beach; there's another Varangian playing dead in the water here. Take him out, and you're clear to loot the corpse hanging on the dinghy, for Lifegem x2 and a Human Effigy. Continue on, pass where the Varangians were hanging to find a summon sign for Lucatiel of Mirrah. Continue left down a narrow dock and kick the wooden platform to open a shortcut to the starting area. Now head left and up some stairs to reach Carhillion of the Fold at the top, and if your intelligence is 8 or above, he'll sell to you. Exhausting his dialogue will send him to go to Majula. Head back the way you came, but this time head down the dock towards the ghost ship. Once you board the ship, head immediately left and up onto the raised platform on the bow, and take out the Archer here quickly. A Varangian and a Gaoler will come running from the other end of the ship. Deal with them, and then head toward the ship stern. Head through a small doorway and down the stairs into the hold to the boss mist. After defeating the boss proceed to the next room and up a ladder to find a chest and a strange contraption; the chest contains a Pyromancy Flame and a Fireball, while examining the contraption triggers a cinematic showing the player sail the ship to the next area, Lost Bastille. Estus Flask Shard x1 Inside a chest in a stone house beneath the bell. Royal Soldier's Ring on the ground floor of the house under the bell lever used to dock the boat, inside a room with poison pots. A chest behind a wall that must be attacked. Down the flights of stairs brings you to the next level down where you encounter an Old Knight. 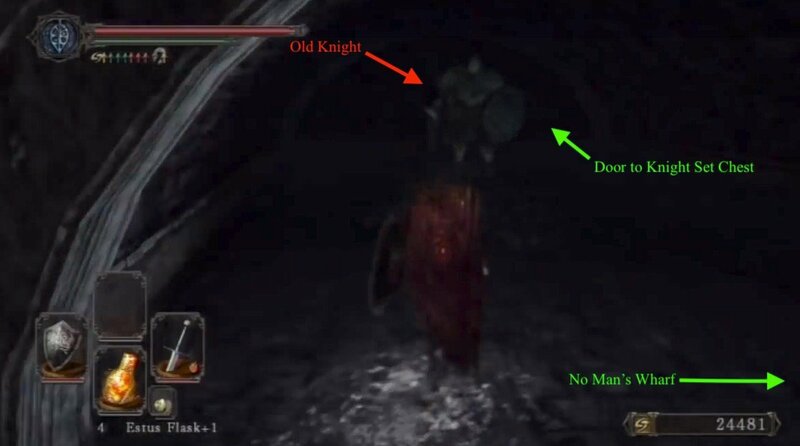 The left passage leads to a dead end so we'll head right to find yet another Old Knight, and beyond a hallway which leads to a round room with a pressure plate elevator in the center. Stand on the plate to descend to the next level down. At the bottom, go through the doorway into the flooded hall. An Old Knight will stand in a room on the left, in front of a doorway. Past the doorway and up the stairs, the left path leads to a dead end at an iron door. Going right to the end of the hallway brings you to an iron chest in the alcove to the right, which contains the Knight Set of armor. Go back down the stairs and return to the lowest level. 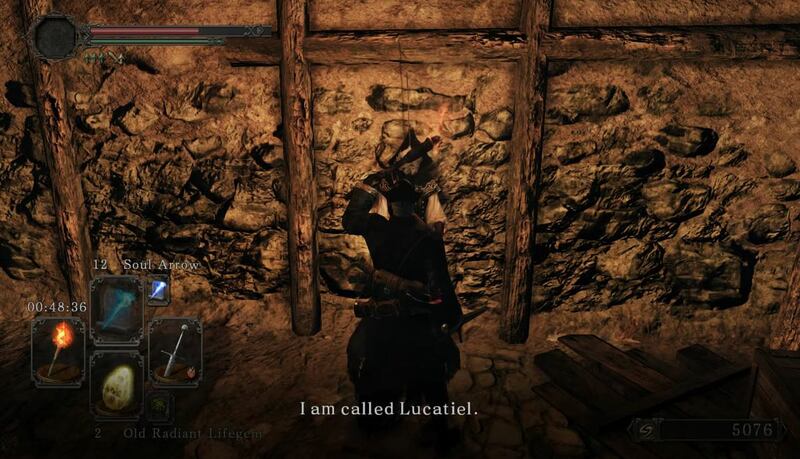 Head left and at the end of the hallway, a knocked out hole in the wall leads to path and a bonfire where the NPC Lucatiel of Mirrah stands in rest against a stone spire. Continuing on will bring you to the location No-Man’s Wharf. Heading right will bring you to a seemingly inaccessible room, blocked by some crates. Destroy these then attack the Darkdweller (See below on instructions on how to deal with them). You'll be attacked by another Varangian shortly after. Pick up the 10x Iron Arrows here too. You will be attacked by a Varangian, and a Hound. Deal with them then break the carriages on the right and proceed. Here you should find the archer from earlier. Deal with him then enter the building on your left to dispatch two sleeping Varangians. There's a chest here containing Brigand set and a Bandit Axe. Dash up the stairs and take out another: if you're too cautious here, the bandit will hit you with a plunging attack on the stairs. In the room at the top of the stairs is a chest with a Repair Powder and a Titanite Shard. Outside this room are two more archers. Dispatch them and note the locked gate here -- we'll open this later for a handy shortcut. Dropping off a short ledge onto a roof after the Pharros' Contraption, head left to a corpse with a Small Smooth & Silky Stone and a Soul of a Proud Knight. Drop back down to the beach, taking care to avoid the Darkdweller in the room below. Heading back up the stairs to the landing in the middle, snipe/pull the Varangian at the top of the stairs. Then, instead of continuing up the stairs, head left and up a flight of stairs to a waiting Varangian. There's a pantry shelf in the corner of the room, which you can destroy to expose a corpse with Ring of Life Protection. Head out the doorway, taking care to deal with theVarangian just outside in an alcove on your left. Continuing ahead will bring you to another Varangian and a Stray Hound. Passing a small room on your left, you'll come to the base of a stairway, which you should ascend. At the top, follow a pathway to the right. You'll see a room ahead, filled with Darkdwellers. Unfortunately, you want to get in that room, because once you clear out all the Darkdwellers, you'll be able to head up the stairs and find Lonesome Gavlan, to whom you can sell for souls anything you don't want. Note that you only get one shot in No-Man's Warf to sell things to Gavlan; he will again appear later, but not too soon, and not here. Anyhow, back to the Darkdwellers, be patient, pulling them out with ranged attacks one at a time, and taking care with their long reach. 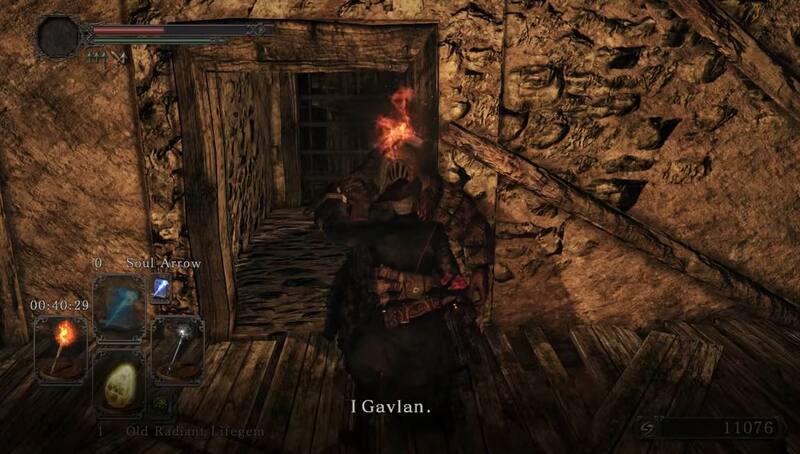 DO NOT try to run past them to Gavlan; They will tear down the wall! A spear or halberd can be helpful. There are some Stalkers in the room below, more in the adjacent room, and more again upstairs. Once you get through them all there's a chest with 1x Greatsword, and another POISONED chest on the right with 2x Silver Talisman, and Gavlan. Heading back out of the Gavlan building, note the corpse with Emit Force, and a possible drop here to the next section. Better to head left to a wooden platform with a door on your left. Dispatch a Varangian Bandit here, and head (carefully) up the stairs to another who is ready to pounce. Go out the doorway, then left up a set of stairs to a platform. There's a bell here with a lever. Pulling the lever will cause the bell to ring and the ghost ship in the harbor to move towards the dock, so that you can eventually access it, and ultimately the Flexile Sentry boss. Continue on, dropping down the gap to the left of the bell. There's a corpse here with 2x Lifegem, 1x Homeward Bone. Heading back to where you just dropped onto this roof, take another short drop. Turn around, and head into a small room with stairs heading down. There are two Darkdwellers below. Halfway down the stairs is a corpse with 10x Fire Arrow. Lure them up the stairs, and/or head back out of the room and drop down to the rocky ledge below, which gives you access to a doorway leading into the same lower room where the Stalkers are. Head down the rock ramp and drop down to the stone-paved yard. Head straight past the brazier on your right, to an archway leading to a door and a room. Opening the door, go straight ahead to an Illusory Wall. Inside are two chests with a Large Titanite Shard, 3x Firebombs. Head back out and left up the stairs to a waiting Varangian. Continue behind him, and raise the shortcut portcullis by pulling the chain, which leads back to a ledge above the courtyard with the Pharros' Contraption. Now backtrack to the ground floor and head back to where you originally dropped down. Just past here on the left is a small room with two sleeping Varangians, and a bunch of urns filled with poison. Another Shadow will show up when you get near the door. Lure the Varangians outside, and dispatch them. Once back in the room, don't break any urns unless you do so from a distance with a long spear or such. Entering the room, on the left are two urns blocking a corpse with Throwing Knife x7 and a Flame Butterfly. In the right corner, behind some other urns is a chest with a Estus Flask Shard. To the left of the chest is an unstable wall which you can shatter with a strong leaping attack or a spell. Behind the wall is a Crystal Lizard, so move quick. There's also a chest in here with a Royal Soldier's Ring. Continue on, pass where the Varangians were hanging to find a summon sign for Lucatiel of Mirrah. Continue left down a narrow dock and kick the wooden platform to open a shortcut to the starting area. Now head left and up some stairs to reach Carhillion of the Fold at the top, and if your intelligence is 8 or above, he'll sell to you. Exhausting his dialogue will send him to go to Majula. Head back the way you came, but this time head down the dock towards the ghost ship. Once you board the ship, head immediately left and up onto the raised platform on the bow, and take out the Archer here quickly. Two more Varangians will come running from the other end of the ship. Deal with them, and then head toward the ship stern. Head through a small doorway and down the stairs into the hold to the boss mist. When you come to the house where you use a Pharro&apos;s Lockstone to light up No Man&apos;s Wharf, face the house, and along one of the left front corners of the house is an invisible hallow. Do not light the sconce ! It make the ennemies aggro from 10x. I just lost 100k souls bc half the map aggro on me as soon as I step on the wonden plank. Wtf FromSoft was it your time of the month ? The trapped chest can definitely vary, I was just killed by a crossbow trap. This NPC shade is available near the shortcut bridge, and is very useful for getting through the area, or fighting the boss, as he uses group heals.